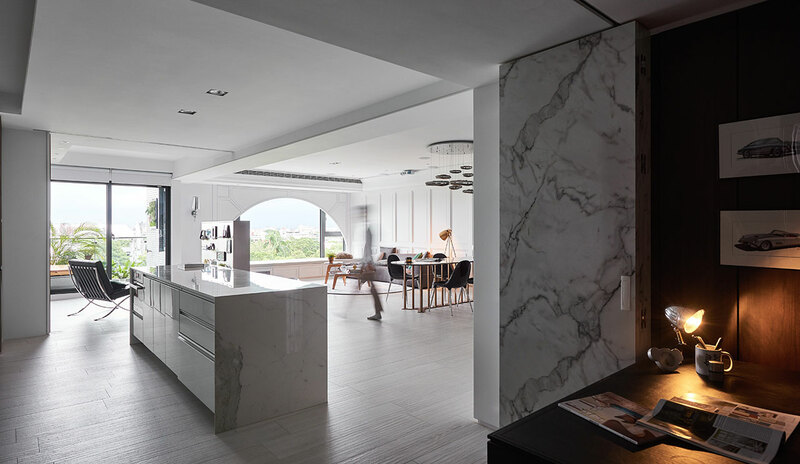 HAO Design had two main requests when hired by the Hsu family to design their new apartment in Pingtung City, Taiwan. 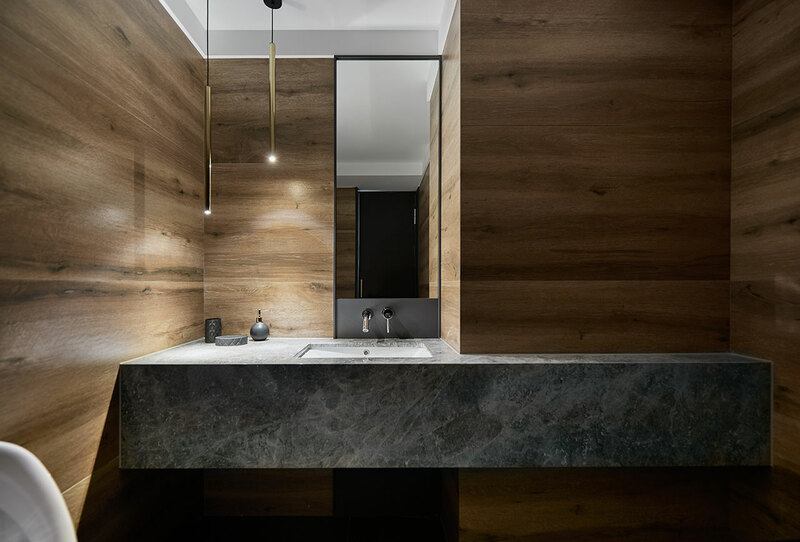 The first was that the entire 165 square meter plan encompass the expansive park views outside the wide windows; the second, that every room be tailor made to suit each of the four family member's needs and stylistic desires. 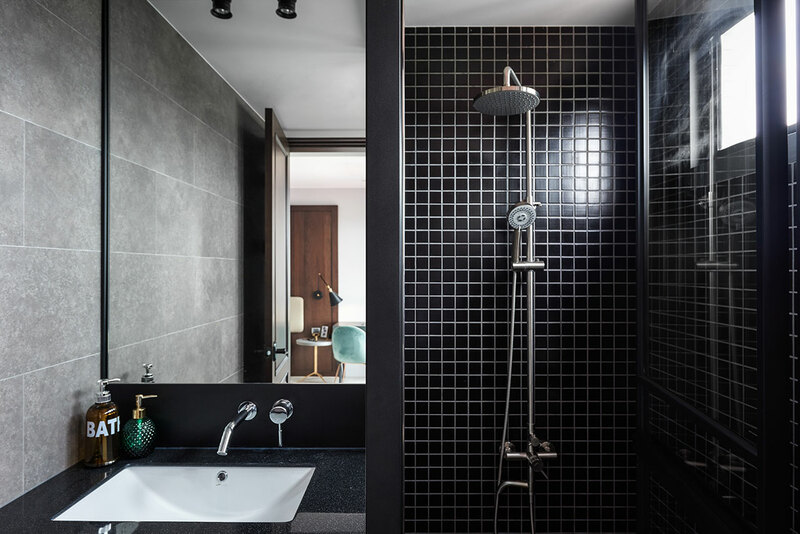 Completed in 2016, Scenic Ballade - as is the project's illustrative title - has fully met its marks. 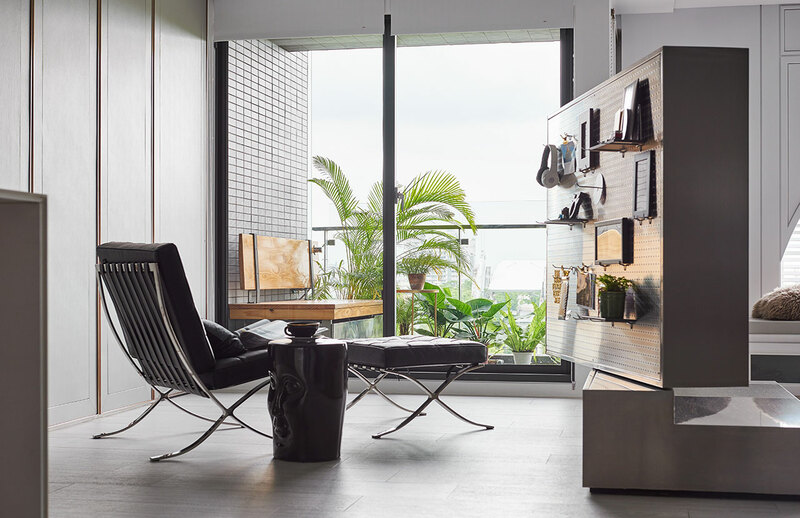 Upon entering through the black lacquered entry, guests and residents are visually pulled through the length of the open plan space by the bright sunlight streaming in over the tree tops of the park below. 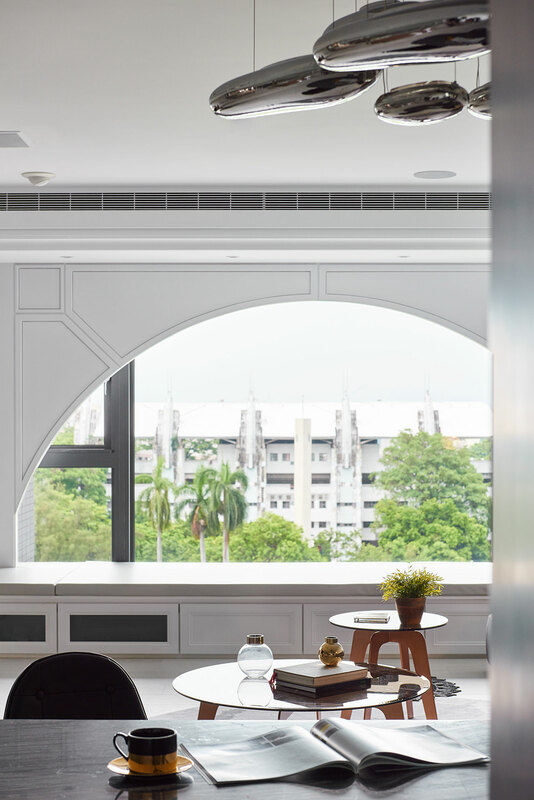 To enhance this image, the designers arched the frame above the window seat before the living area with a corniced, white paneling that matches the walls. 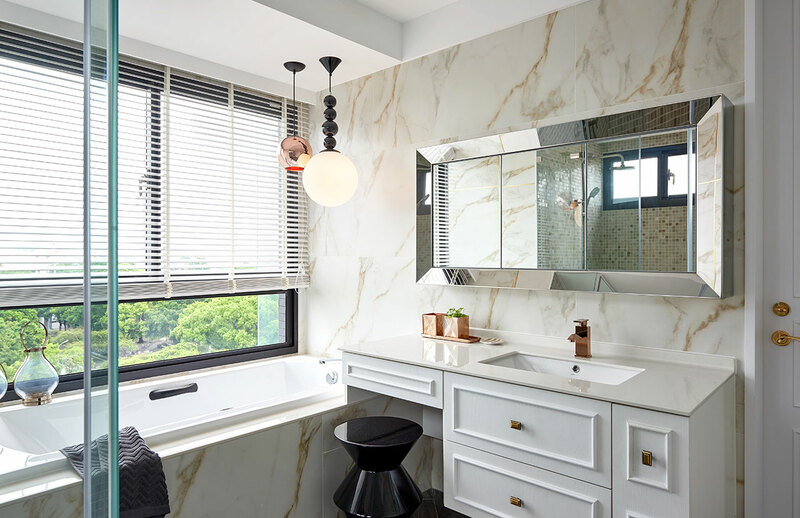 In fact, white is the primary backdrop throughout, from the bleached Spanish wood grain floor, to the chandelier strung ceiling. 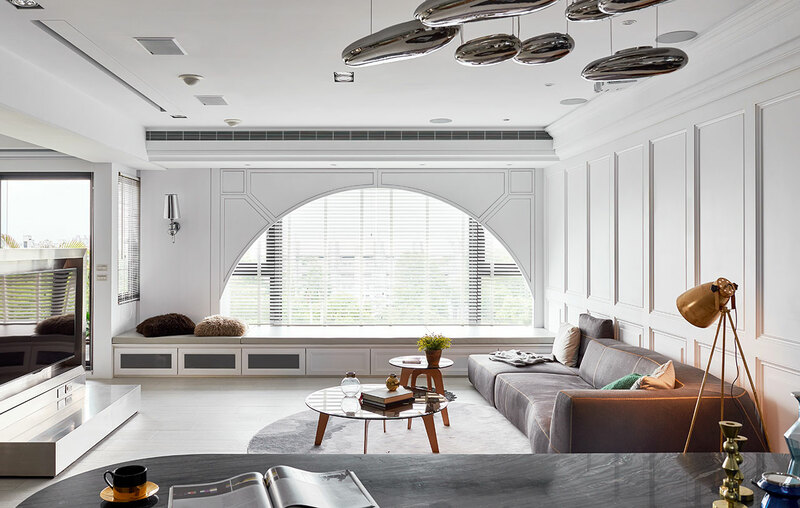 This "blank" canvas is punctuated by furniture in cool bolts of gray, black and chrome featuring rounded angles, such as the light gray circular carpet in front of the black leather sofa, as well as the marble-columned and chrome-legged dining table. 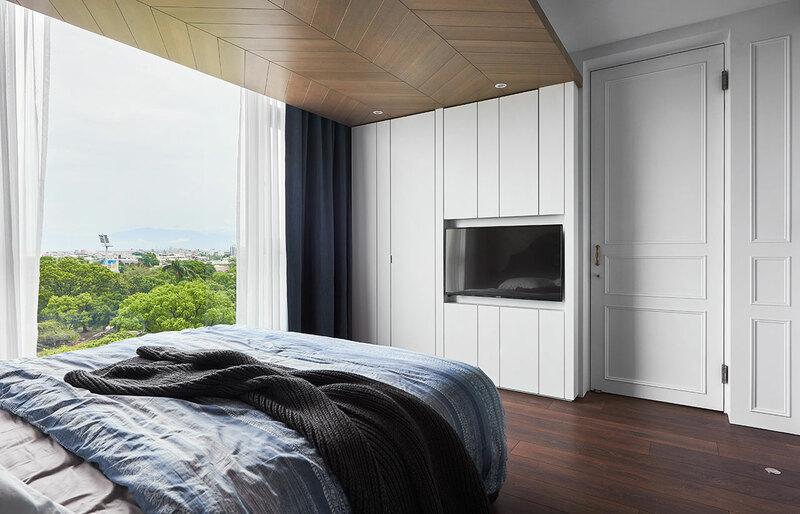 Across the room, the designers carved a private nook in front of the window for the father of the family that is separated from the main living space via a large screen television on a 360˚ rotating cabinet. 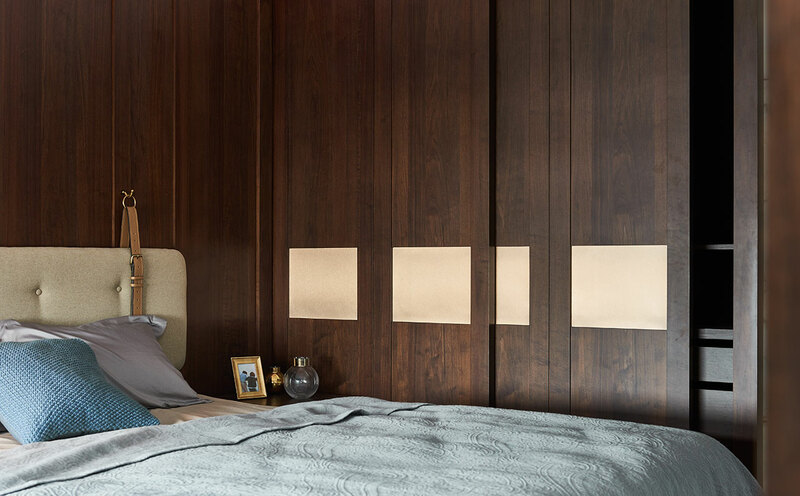 This affords both privacy when desired, as well as giving television access across the room when family viewing needs arise. The private nook also encompasses a small covered veranda, complete with wood bench and foot bath. Across from that comes the mother's special request: an open plan kitchen with wide countertops, a large pantry and plenty of room to create culinary masterpieces for her family. 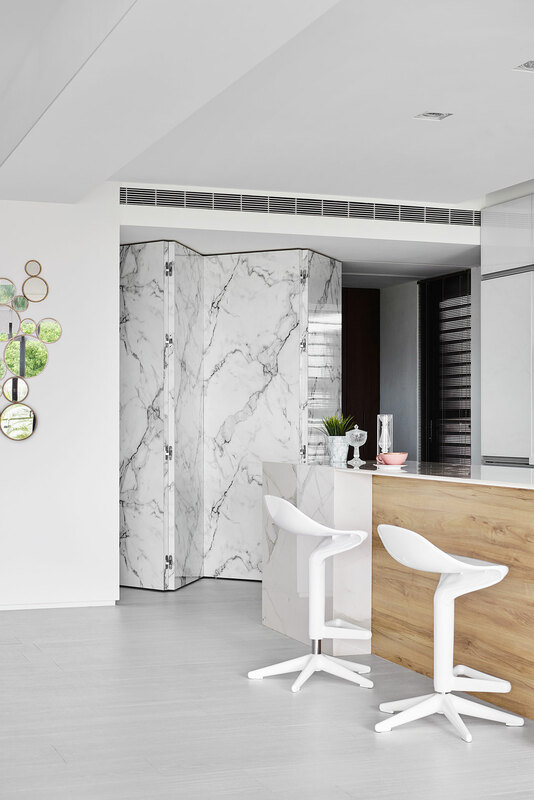 Featuring a large center island which delineates the kitchen from the main living space, the kitchen is crafted out of light gray veined, white Volakas marble, light walnut wood paneling and white lacquered cabinets. 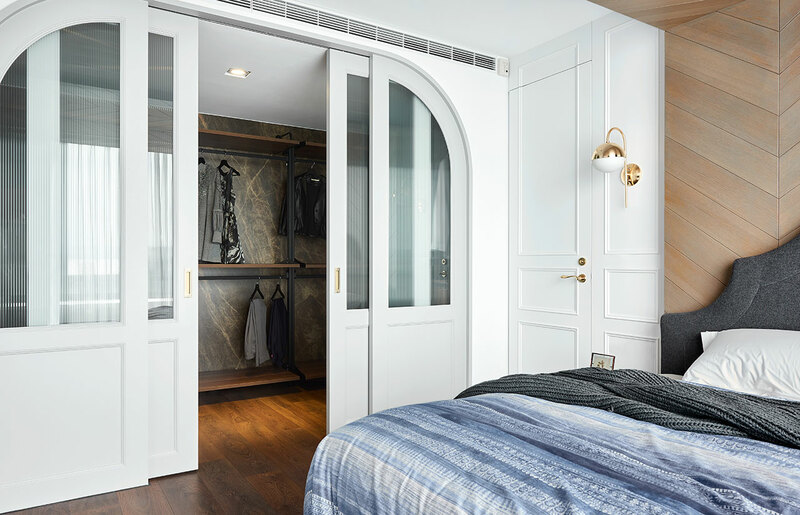 A hidden doorway between the kitchen and the private nook leads to the master bedroom. 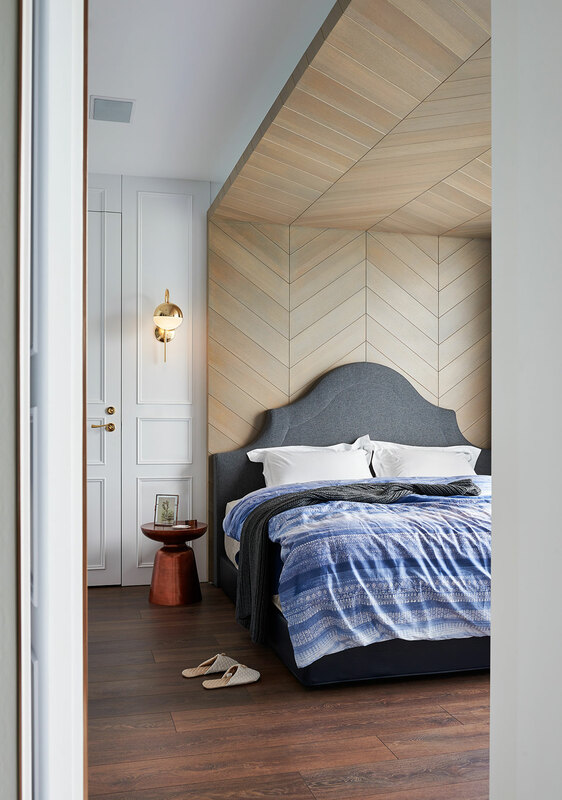 In here, the designers darkened the wood floor so as to create a cozier ambiance and crafted a wood "leaf vein" patterned backsplash reaching behind and above the bed, in order to further this enveloping feeling. 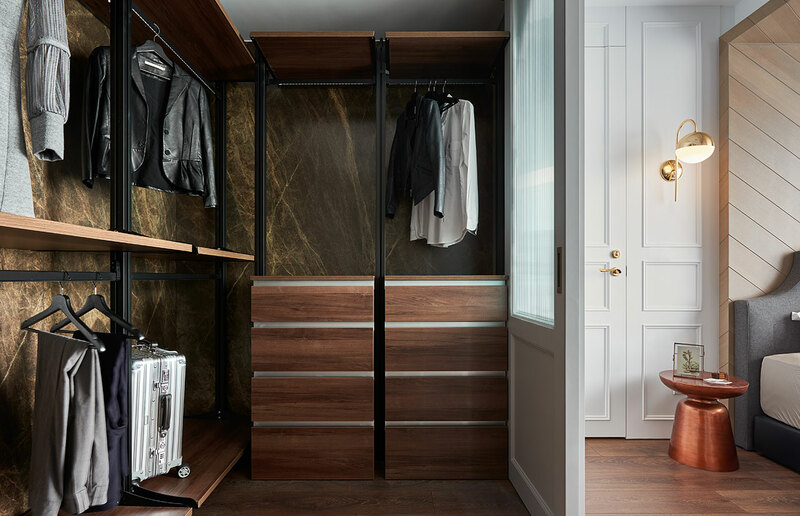 The walk-in closet faces the window - with more of the magnificent park view - and features a doorway that mirrors the corniced, arching window frame in the living space. 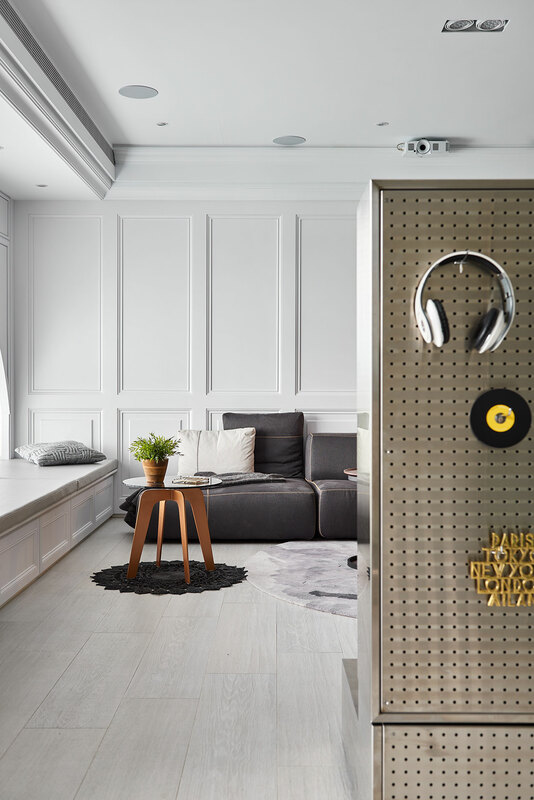 Both of the children's rooms are also tailor-made to suit their residents and mirror the same elegantly minimal yet modern décor of the rest of the apartment. 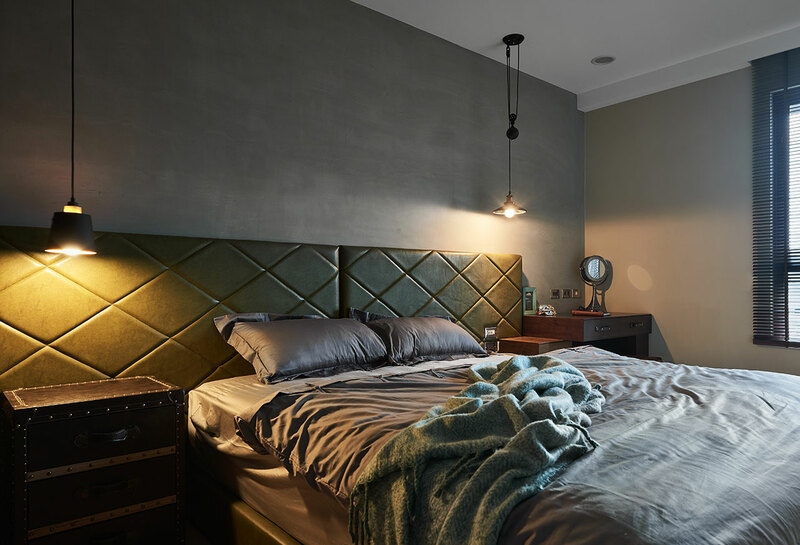 The designers describe them as "distinctively furnished boutique hotel rooms" and - between the tufted leather headboard and polished cement walls of the daughter's room and the son's room's deep walnut wood paneled walls and closet - it's easy to see why. 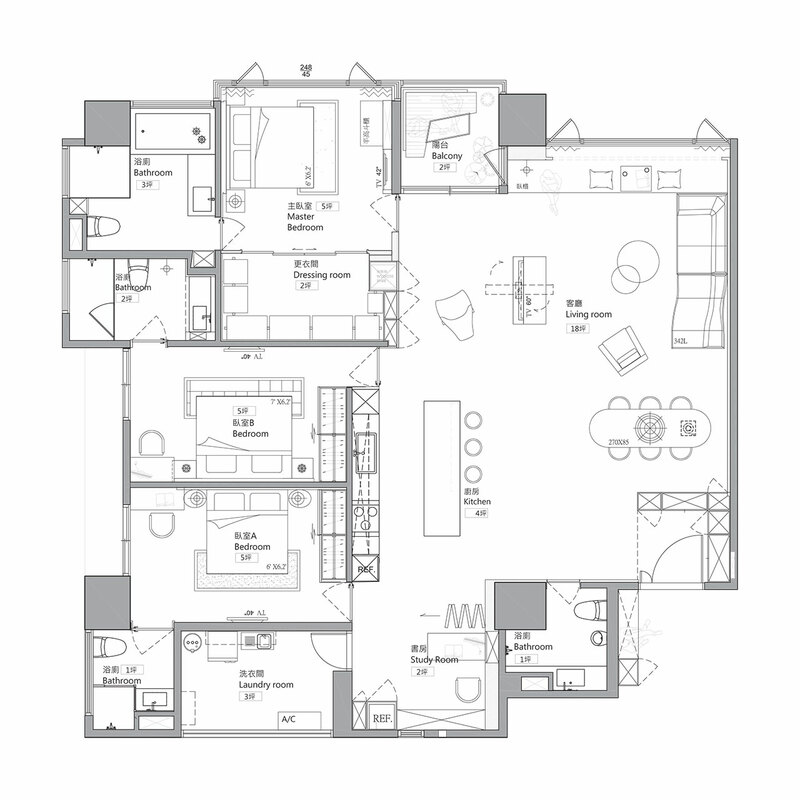 But thankfully for this family this isn't a transient stop towards a destination but the destination itself; a home that is as at once elegant and modern, that provides the best for the family's needs from their private spot above the trees. 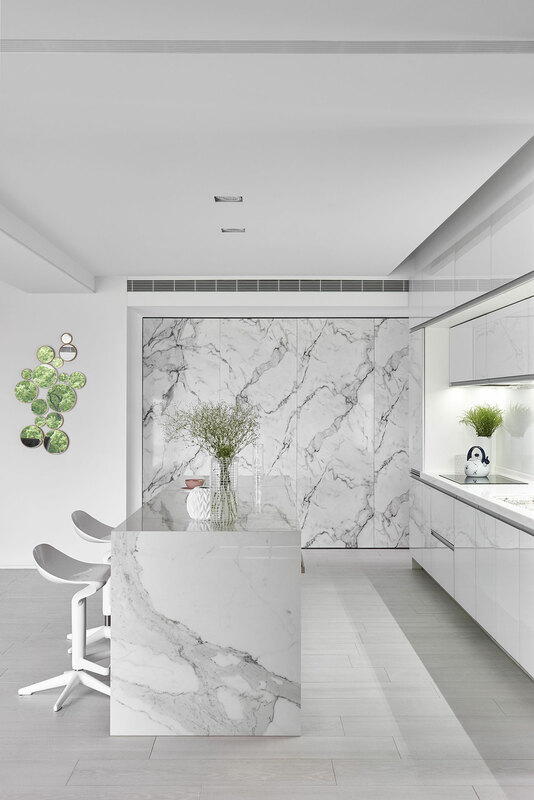 Τhe kitchen is crafted out of light gray veined, white Volakas marble, light walnut wood paneling and white lacquered cabinets.